April 18, 2014 0 comments on "Chili Seasoning Mix"
If you have ever made homemade chili, you probably purchased a package of chili seasoning at the store to flavor it. It is very easy to make your own chili seasoning mix. 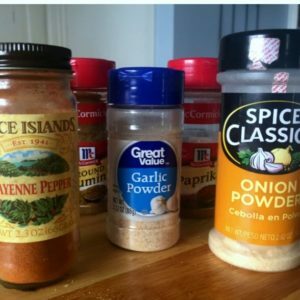 Here is an easy chili seasoning mix for you to try. All you have to do is mix all the ingredients together in a mason jar or other airtight container and add about 2 tbsp. of seasoning mix to your next chili recipe. You can easily change the amounts of the ingredients, if you want more cayenne pepper or garlic powder. Adjust the seasoning according to your tastes.